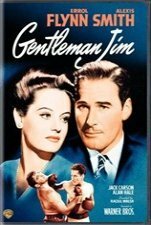 Gentleman Jim is a 1942 film starring Errol Flynn as heavyweight boxing champion James J. Corbett. Gentleman Jim is based on the real life story of James Corbett who was dubbed the "Father of Modern Boxing" because of his footwork and innovations in technique to the sport rather than the brawling style of his opponents. Corbett is best known for knocking out John L. Sullivan in the 21st round thus winning the World Heavyweight Boxing Championship.